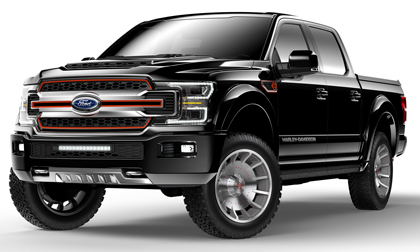 MILWAUKEE – Aug. 30, 2018 – Harley-Davidson™ and Tuscany Motor Co, a Fox Factory Holding Corp. (NASDAQ:FOXF) (“FOX”) subsidiary, have collaborated on the build of an all-new custom 2019 Ford F-150 pickup truck. Tuscany is a Ford Motor Company specialty vehicle manufacturer in the personal-use segment. The concept truck will be part of the company’s 115th Anniversary Celebration. Harley-Davidson and Tuscany share the same passion for producing premium, quality and exciting new products. Harley-Davidson enthusiasts will be able to see the exciting new concept vehicle for themselves at the H-D Museum™ during Harley-Davidson’s 115th Anniversary in Milwaukee, Wisconsin, beginning on August 29, 2018. Tuscany representatives will be on site to answer questions when the company and Harley-Davidson display the concept model for the first time at the Harley-Davidson 115th Anniversary celebration in Milwaukee, Wisconsin. Tuscany Motor Co. since 1988 is the leading provider of specialty trucks. Tuscany is the designer and manufacture of the Shelby, FTX, BLACK OPS and TONKA brands on the F-150 and F-250. Learn more at drivetuscany.com. Headquartered in Scotts Valley, CA, Fox Factory Holding Corp. (the “Company”) designs and manufactures performance-defining ride dynamics products primarily for bicycles, on-road and off-road vehicles and trucks, side-by-side vehicles, all-terrain vehicles, snowmobiles, specialty vehicles and applications, and motorcycles. The Company is a direct supplier to leading power vehicle original manufacturers (“OEMs”). Additionally, the Company supplies top bicycle OEMs and their contract manufacturers, and provides aftermarket products to retailers and distributors. FOX, Fox Factory, and BDS Suspension are registered trademarks of Fox Factory, Inc. NASDAQ Global Select Market is a registered trademark of the NASDAQ OMX Group, Inc. All rights reserved.